This review has been postponed because of yesterday's Digimon reference. We apologize for this misconduct of the Pokenerd here and have taken actions accordingly. *cough* Alright, I'm back, let's review M Latios-EX. So M Latios-EX, as part of what I'm calling the "Link Gen" of Megas, has another Spirit Link to work with. Which is pretty good, can't complain. 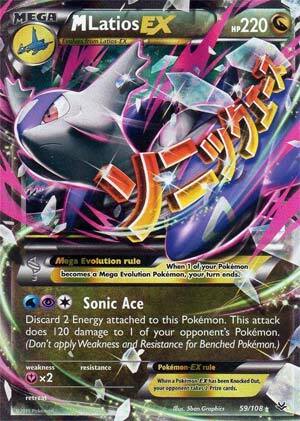 He doesn't have an Ancient Trait or Ability though (come to think of it, I don't think any of the Megas have an Ability...), so all we've got is an attack in the form of Sonic Ace. And being on a Mega, it's bound to be a doozy! What do we get for investing 3 Energy into it? 120 damage to any one Pokemon. That's...well, not as exciting as I'd like it to be. Not to mention you have to discard two Energy to use the attack. For most of your big Pokemon-EX, it's more of a set-up, and for most other Pokemon, it's a OHKO, so you could potentially be claiming a Prize with this guy. But after that, M Latios-EX loses a lot of steam. Sure, he's got Double Dragon Energy and maybe a little bit of Reshiram or something like that, but given his Water-Psychic-Colorless cost, it's not gonna be as fast as you'd like. I'd say he's good for clean-up or sniping a troublesome Bench-sitter, but aside from that, M Latios-EX isn't that big of a deal. Granted, what you do end up sniping may end up winning you the game, and there is stuff like DDE and Mega Turbo to consider as well, so it just depends on your situation more than anything. Arora Notealus: Mega-Latios and Mega-Latias are...interesting. Like the main difference in their design is the angle at which the wings bend towards - Latias' bends forwards towards the head while Latios' bends towards the back. Ain't that something? Weekend Thought: Miss Lysandre's Banned Card already? It's okay, we're here for you. I'm sure there are going to be some more game-breaking cards out there in the future. In the meantime, how about this week's cards? Think the Latios-EX pair is underrated? Or maybe that I was way too harsh on Zekrom? Mega Latios EX, who sadly looks just like Mega Latias EX (can’t they even have different color palettes or something? This color at least makes sense for Latios, but Latias was red, and didn’t have any…light purple on her at all!) Well, what’s done is done, but it’s kind of disappointing. But, I’m here to review a card, not Gamefreak’s questionable design choices! 220 HP is up where most Megas have been, Fairy weakness is here just like most Dragons in this set, but what’s really nice is that free Retreat Cost! Looks like Latios is finally fast enough to get a free retreat now! Also, remember that Mega Latios EX has access to a Spirit Link, so it doesn’t necessarily have to waste a turn of attacking to Mega Evolve. We close out part two of our XY: Roaring Skies Dragon Week… yes I’m labeling it after the set even though I included an unrelated promo card. As you were already informed, today we are looking at M Latios-EX (XY: Roaring Skies 59/108, 102/108). As such this will hopefully be the last time (well, for a bit) that I inform you the Dragon-Type is solid: they have some good support and don’t have to worry about Resistance, though they only get to exploit Weakness when up against BW-era Dragon-Types. They haven’t been doing a lot in the top cut lately at tournaments, but that can be as simple as individual cards or individual cards plus their particular Type support being the best: get something similar that happens to be a Dragon-Type, and it can still rise to the top. Being a Mega Evolution is a real drag; true it so far has always meant better attributes and/or effects for the cards involved, but the end results haven’t always been worth the hassle and said goodies aren’t guaranteed, not unlike the benefits of being a Pokémon-EX. Speaking of which, all the drawbacks of being a Pokémon-EX apply - they are worth an extra Prize when KOed, some beneficial effects won’t work and some detrimental effects specifically only work against them - with the added drawback that Mega Evolution ends your turn unless you use a work around like a Spirit Link card: in this case Latios Spirit Link is your only real option. Mega Evolutions are like a nerfed Stage 1, in a sense… though with the Spirit Link cards (and some better effects) they have gone from a joke to a serious part of the game. There actually is one piece of generic Mega Evolution support in the form of Mega Turbo, but while at first it seemed like an obvious must-run (attaches a basic Energy card to one of your Mega Evolutions), now that we can’t recycle it over and over again, it only seems to favor certain builds. 220 HP is only 10 above the minimum we’ve seen on Pokémon-EX, but it is still a good amount that is hard for most decks to OHKO, at least outside of Weakness. Fairy-Type Weakness isn’t a good thing, but it isn’t as bad as many (perhaps even most) others. There are Fairy-Type attackers that can be nasty, but they tend to be restricted to Fairy-Type decks. Something like Xerneas (XY 96/146; XY: Black Star Promos XY05) is actually going to whiff without a buff… which is is again “less bad” as the rest of the Dragon-Types we’ve been looking at went from 2HKO to OHKO, this one goes from 3HKO to 2HKO (just missing OHKO by 20 points of damage). Something like M Gardevoir-EX is simply going to need less Energy, making a OHKO go from “possible” to “probable”. The lack of Resistance is the worst but as these last two weeks have helped to emphasize that is typical of most cards as Resistance is uncommon; it provides a benefit when present but it is a small bonus, not something one expects. It has a perfect free Retreat Cost; it doesn’t get any better. Being a Mega Evolution without an Ancient Trait (so far I don’t recall any with an Ability), M Latios-EX has a single attack - Sonic Ace - which has an upfront cost of [WPC] and the first part of its effect is to discard two Energy from M Latios-EX (or whatever Pokémon is using the attack); then you select one of your opponent’s Pokémon and do 120 damage to it. If how I worded that seems odd, just a reminder there are some Pokémon that can copy attacks; some copy everything (even the Energy costs for using the attack) while others copy only the effects: that self-discard will get copied since it is listed as an effect and not a cost. If you somehow can use the attack with less than two Energy attached, you would only have to discard as much as is available and the attack would still go through. 120-for-three with a two Energy discard is good and when you add in the capacity to hit the Bench it is pretty great… though likely appropriate given everything else that goes with being a Mega Evolution, as well as the attack requiring both [W] and [P]. M Latios-EX has to come through Latios-EX and we have two options: BW: Plasma Freeze 86/116 (and 113/116) or XY: Roaring Skies 58/108 (and 101/108). Both are Basic Dragon-Type Pokémon-EX with 170 HP, no Resistance, Retreat Cost [CC], no Ability, no Ancient Trait and two attacks. BW: Plasma Freeze 86/116 has Dragon-Type Weakness and I’m not sure if that is better or worse than the Fairy-Type Weakness found on XY: Roaring Skies 58/108. The first attack on BW: Plasma Freeze 86/116 is “Mach Flight” for [PC] which hits for 40 damage while preventing your opponent’s Active Pokémon from retreating while XY: Roaring Skies 58/108 has “First Raid” for [P] which also does 40 damage and states it can be used even on the very first turn of the game. The big attack on BW: Plasma Freeze 86/116 is “Luster Purge” which requires [WPC], just like Sonic Ace. Instead of discarding two Energy it requires you discard all Energy attached to Latios-EX (meaning itself) but you hit your opponent’s Active for 150 damage instead of 120 to the target of your choice. XY: Roaring Skies 58/108 needs [WPPC] for its big attack (Light Pulse), and it hits for 110 damage while protecting itself from attack effects until the end of your opponent’s next turn; the damage is a bit low but the effect can be handy; just remember effects that don’t target Latios-EX aren’t prevented. So which of these two should you use? Probably both and I’ll explain why… though you heard much of it yesterday. The changes in the card pool since its release make BW: Plasma Freeze 86/116 far better than it when it was reviewed, where baby_mario gave it a mere 2/5 and Ness gave it the minimum 1/5 we use on this site. Double Dragon Energy makes both attacks much faster without adding in complicated combos and of the two Latios-EX and M Latios-EX, BW: Plasma Freeze 86/116 has the highest base damage for an attack (Luster Purge). XY: Roaring Skies 58/108 needs less Energy for its first attack and while pricey, its second attack requires no discards and can protect it from some more technical attackers. M Latios-EX brings in a strong enough Bench hit to OHKO Shaymin-EX (XY: Roaring Skies 77/108, 106/108), allowing a quick two Prizes to win the game or at least force the opponent to KO it right away to avoid you winning the Prize trade. As stated, you might be able to make use of Mega Turbo with M Latios-EX… or rather make “good” use. I am less comfortable relying on it now; having enough basic Energy in your deck as well as enough ways to reliably get it into the discard pile can be challenging. Fortunately you don’t have to choose between running zero or running four; even just one or two can allow for surprise acceleration. Constantly reloading M Latios-EX for Bench bashing doesn’t seem worth it, unless your opponent has enough low HP Pokémon there so that M Latios-EX could basically sweep the game. I like it as a backup sniper or alternate up-front attacker (Sonic Ace hits harder than Light Pulse). As mentioned yesterday, you can boost damage with Altaria (BW: Dragons Exalted 84/124; BW: Black Star Promos BW48; BW: Boundaries Crossed 152/149) or go for additional Bench damage with Golbat (XY: Phantom Forces 32/119) and Crobat (XY: Phantom Forces 33/119). The former won’t help with Bench hits but can get Sonic Ace into OHKO range for most things you’ll find in an opponent’s Active position that aren’t Mega Evolutions; the latter will help with either Bench hits or taking out the Active, and can even be split among multiple targets. In either case (or as a third option) you can just focus on hitting quickly with Latios-EX, then if it is “safe” Mega Evolve into M Latios-EX to finish something off and survive the next hit, then try to bounce M Latios-EX and do it again. In Expanded, there is a slight bit of help in that some older Bench-sitters are small enough for Sonic Ace to take a OHKO (even if only for a single Prize), while in Limited it will boil down to pulling Latias-EX and perhaps Latios Spirit Link as well. If you do manage to get all three for Limited play, go for it! The main hope of overcoming a fully powered Pokémon-EX is to overwhelm it with smaller attackers or to throw up sacrificial spare Pokémon while trying to build something of your own up on the Bench. This gives you the option (you can always choose not to actually play M Latios-EX when it is in your hand) of doing something about that. Summary: M Latios-EX is one of the Mega Evolutions I think of more like a Technical Machine - some may try to focus a deck around it and Sonic Ace but I find it better to compliment what either Latios-EX can do with the option to Mega Evolve into something with more HP and a lower Retreat that can hit the Bench. Especially with how popular Shaymin-EX has proven. Still, it hasn’t been enough to help it win anything noteworthy, so I won’t score it too high. I actually had this alongside Latios-EX and Latios Spirit Link as my seventh place pick for our Top 10 XY: Roaring Skies list. It hasn’t lived up to my expectations, so it is probably good that it didn’t make the final list.